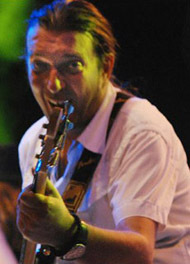 Vladan Djurdjevic - Vlajko was born in Valjevo on July 21st, 1964. His complete biography is directly connected to Milan's since they have spent the ENTIRE life together in all their bands. Except Milan's time with a band "Smak" ( 1986 to 1987) and his time spent in YNA (Yugoslavian national Army - 1988), they have spent all their time working on the same idea, which was realized in the beggining of 1993 when they founded "Neverne Bebe". An interesting fact from the beginning of Vlajko's career is that in his first band, he was a singer, but in 1978 he played Bass for a band "Meteori" (Meteors). Upon completing his YNA service (1984), he was studying Journalism at FPN (University), a little later he enrolled in another Faculty and was studying Ancient History. His major role during all these years has been the organization and management of the band, around the band, and everything that this business involves, that is: practice, travels, concerts, accomodations and numerous other things. In "Neverne Bebe", he has more than one role, but the most iportant one is selecting a play list for their concerts. Almost always, he listens to hear the voice of the audience and the audience is always a priority. He is also responsible for all contacts with friends and fans of the band.